At Fingerprinting Express, we love teachers and everything they do for our children and our future! To support our Nevada educators, we are proud to give teachers a heavy discount on the cost of their Nevada Department of Education fingerprinting. This is our way of giving back to the community and encouraging more teachers to get involved. We also offer discounts for support staff and in-school volunteers looking to dedicate their time to helping our youth. Currently teachers are required to be fingerprinted upon initial licensure and when they renew their license (a standard license is valid for five years). We are pleased to be an approved vendor for the Nevada Department of Education, the Carson City School District, and the Washoe County School District’s volunteers. We can provide fingerprint background checks for public schools, including CCSD fingerprinting, as well as fingerprinting services for private schools and charter schools. Whether you are applying for your initial licensure or are reapplying, you will have to register through OPAL (Online Portal for Application and Licensure). Once registered, you will receive notifications through email and text message as your application moves through different steps of the process. Fill out the self-disclosure questions and submit other requirements as outlined in the application process. Pay the required fees through OPAL. Once you have completed the OPAL requirements, you will receive an email with instructions for your background check and fingerprinting. Bring the email receipt that you received into any of our Fingerprinting Express locations along with a government-issued ID. We can take your fingerprints via Livescan electronic fingerprinting and submit them directly to the NV Department of Public Safety and FBI. Or, if you prefer, you can have your fingerprints taken on an FBI form FD-258 card (or equivalent) and then submit the fingerprints to the Nevada Department of Education. Note: You may have to process fingerprint background checks twice: once for your state license and again for the school or school district in which you are employed. That is because these agencies are not allowed to share criminal history information. If you need fingerprints done for your teacher’s license or renewal, look no further than Fingerprinting Express! Our expert technicians and clean, modern facilities ensure that your experience is a fast and pleasant one. No appointment is necessary—just stop into one of our four locations for fingerprinting or give us a call at 800-919-0227 with any questions. Q: Do you provide fingerprinting cards and Livescan fingerprinting services for teachers, support staff, and volunteers? A: Yes, while the Nevada Department of Education recommends Livescan electronic fingerprinting, we can also use fingerprint cards, which you can send or drop off to the Department Board. Q: I currently live in another state. Will the Nevada Department of Education accept Livescan submissions from the state I currently live in? A: No. 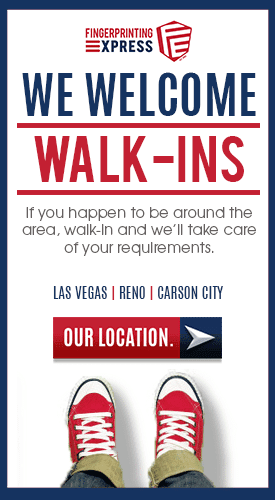 The NDOE can only accept Livescan submissions from Nevada. If you live in another state and are applying for licensure in Nevada, you will need to submit a fingerprint card. Q: When I submit fingerprints to the NDOE for processing, where are they sent? A: Your fingerprints are sent to both the FBI and Nevada Department of Public Safety, who will both run your prints and send your criminal history reports back to the NDOE. Q: How long does the background check process for my teaching license or renewal take? A: According to the Department, it can take up to eight weeks to process your license. Livescan will yield faster results than fingerprint cards and eliminates the risk of having the cards get lost in the mail.